Several vehicles remained stuck in mud on Pacific Coast Highway near Malibu, where rain triggered debris flows the previous evening and forced the closure of a 13-mile stretch of the highway. MALIBU, Calif. -- Several vehicles remained stuck in mud Sunday morning on Pacific Coast Highway near Malibu, where rain triggered debris flows the previous evening and forced the closure of a 13-mile stretch of the highway. Caltrans said PCH would remain closed in both directions from Las Posas Road in Ventura County to Encinal Canyon Road in Malibu until at least Monday. Meanwhile, maintenance crews at the scene continued to assist with towing and cleanup. Malibu residents, some of whom are survivors of the Woolsey Fire, described their reactions as boulders, rocks and tree limbs covered PCH in the mudslide. "Last night I was full-on PTSD after what we experienced with the fire," said Jordan Jacob, who lost his home to the November wildfire. "It brought back a lot of feelings, like, oh no, we gotta go, we gotta be prepared. "But we were pretty well-prepared," he added, "and we learned a lot from the fire that we are going to take on mudslide season." 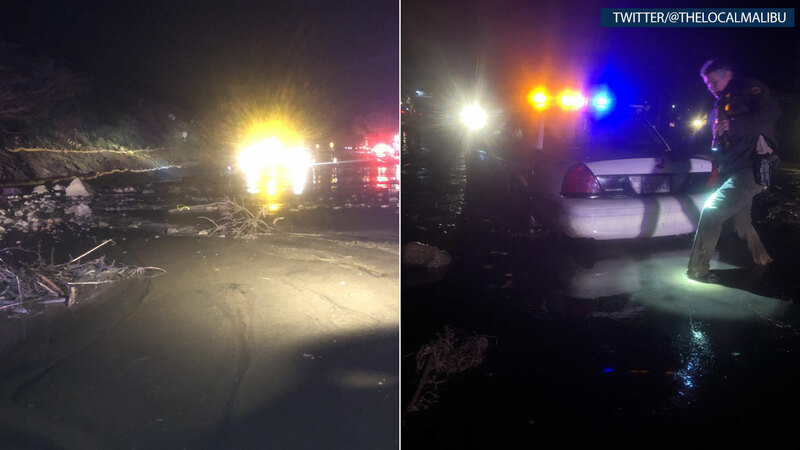 Photos from the PCH in Malibu show officers and vehicles stuck in deep trenches of mud after rains caused a mudslide in the recently burned area.